The power bar AFL reference line is an imposing example what can be achieved if all potential of high aligned mains-filter technology is employed. This outstanding result can only be reached if technology and craftsmanship is on its highest level and go side by side. The distinguished AFL reference line with its unique filter architecture outperforms most common-build filtered power bars. With its elaborately new “on-site” filter technique, a boundless current flow and a maximum of noise suppression is secured. More than 20 years of experience in development, design and in-house manufacturing of mains filter have been employed to maintain this outstanding power bar. All filters are totally “invisible” for all 50- or 60-Hertz mains frequencies, but at the same time all high-frequency distortion as EMI and RFI are effectively removed. To reach this ambitious goal, the complete filtering needed to be tailored new. Only the new implemented “on-site” filtering ensured an outstanding damping of the very high frequencies. 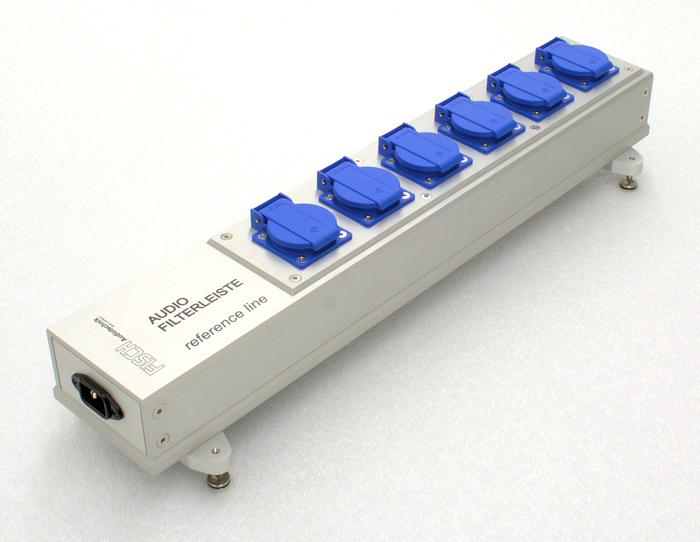 This solution keeps away unwanted frequencies from your sophisticated electronic components. The current flow for all connected electrical components is totally unrestricted and free of any distortion. Even power amplifiers with extremely high power surges will get a lossless current flow. The enhancement what an AFL reference line to any hi-fi or AV system does is something straightforward. The soundstage becomes more natural and a gain in stability, the music becomes more clarity and charm. All outlets are equipped with an additional second filter stage. These filter stages are of non-disruptive design, and build into the internal wiring. There is no possibility that this filter will cut off any dynamics, or even restrain the current flow. This “on-site” filtering is located to close proximity of every single outlet. Therefore, all outlets are filtered in the same way and identical, at the same time, all outlets are isolated from each other. The back interferences from a connected device will no longer harm or distort a neighbouring outlet. This leads to an extraordinary gain in sound performance for all connected devices, superior to all conventionally build power bars. Audio devices, out of the absolute top range, where normally no further improvements are expected, will even gain in sound performance. The gain in sound quality is spontaneous and easily detectable. In the same thoroughly manner as all current conducting components have been selected, the entire mechanics is designed and build to the same uncompromising high standard. The complete housing is made out of massive aluminium. The design is optimised to shield the electric parts against unwanted radiation and to keep all mechanical vibrations away from the electric circuit. This housing is an important part for an exceptional positive total result. Any part of the AFL reference line is undergoing a very stringent quality-check before it is assembled to a quality-build power bar. A AFL reference line is a perfect base for all precious audio- and AV-equipment. It is unparalleled in its ability to ensure that every component is performing at its best, for a natural and undistorted music reproduction.